Surah al Kafirun is a Makki Surah. 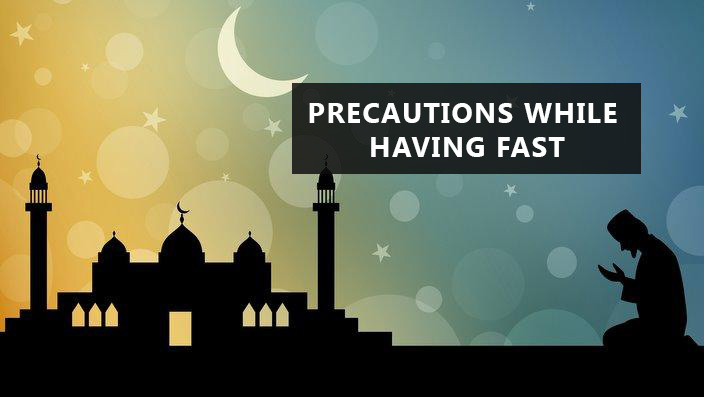 It consists of 6 ayaat (verses) only. 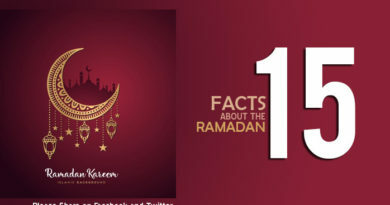 Al-Kafirun is the 109 chapter of Holy Quran and is also is also known as Al Kafiroon the word Kafirun is an Arabic Word which means “The Disbelievers”. The surah addresses the non-believers in very harsh tone while giving a lesson of taking them hard and disassociation from them. It has many names Al Kafirun, Surah Qafiroon, Surah al Kafiroon. The concept of Makki and Madni Surah is that a Surah is called Makki which was revealed while the Holy Prophet (peace be upon him) was in Makkah before the migration. And the Madni Surah is the one which came into being after the migration of the Holy Prophet to Madinah. It is noted that once Quraish proposed to the Holy Prophet (peace be upon him) that they would give him all the wealth and everything that he desired on the condition that he will not speak against their gods. The other proposal which was better in the eyes of the Quraish was that, if the Prophet Muhammad (S.A.W) would worship their gods, they would worship Allah in return. At this point, the Holy Prophet (S.A.W) left the matter to Allah. This is how Surah al Kafirun came into being! This Surah is addressed to the non-believers or the non-Muslims, but it is not limited to them. As this Surah is a part of the Qur’an, every Muslim must recite this Surah to stay away from Shaitan and all sorts of Shirk. The significance of Surah al Kafirun can be noted by a single fact that if you recite this Surah, you will be rewarded equally to reciting a quarter of the Holy Quran. However, reciting this Surah purifies your soul and keeps you away from all types of Shirk as well. It is also noted that whoever recites this Surah before he dies or if someone dies after reciting this Surah, he will be considered a martyr. (1)Although the Holy Prophet (upon whom be peace) has been commanded to tell this to the disbelievers plainly, the theme that follows makes it explicit that every believer should tell the disbelievers plainly what has been said in the following verses; so much so that the person who has just believed and repented of kufr is also bound to express similarly his disgust with and disapproval of the creed and rites of worship and gods of kufr. Thus, though the first addressee of the word qul (say) is the Holy Prophet (upon whom be peace) himself, the command is not restricted to him alone but it reaches every believer through him. (3) The word used is “O kafirs” and not “O mushriks”; therefore, the addressees are not only the mushriks but all those people who do not acknowledge Muhammad (upon whom be Allah’s peace and blessings) as Allah’s Messenger and the teachings and guidance brought by him as the teaching and guidance given by Allah Himself, whether they be Jews, Christians, Zoroastrians or the disbelievers, polytheists and pagans of the entire world. There is no reason why this address be restricted to the pagans of Quraish or of Arabia only. (4) To address the deniers with the word “O kafirs” is just like addressing certain people as “O enemies”, or “O opponents”. Such an address is not, in fact, directed to the person of the addressee but it is made on the basis of their characteristic of enmity and opposition, and lasts only until they are so characterized. If one of them gives up enmity and opposition, or turns a friend and supporter, he no longer remains the addressee of this word. Likewise, the address of “O kafirs” to the people also is in view of their characteristic of kufr and not their person. This address would be perpetual for him who continues to be a kafir till death, but the one who believes will no longer be its addressee. (5) Many scholars from among the commentators have expressed the opinion that in this Surah the address of “O disbelievers” applied only to a few persons of Quraish, who were visiting the Holy Prophet (upon whom be peace) with proposals of compromise regarding religion and about whom Allah had informed His Messenger than they would not believe. They have formed this opinion for two reasons. First, that it is followed by La a `budu ma to `budun: “I do not worship him or those whom you worship” . They say that this does not apply to the Jews and Christians, for they worship Allah. Second, that this is also followed by: wa la antum `abiduna ma a`bud “Nor are you worshipers of Him Whom I worship”. Their reasoning is that this statement does not apply to the people who at the revelation of this Surah were disbelievers but later believed. Both these arguments are incorrect. As for these verses, their explanation that follows will show that they do not bear the meaning which has been understood from them. Here, to point out the error of the reasoning it would be enough to say that if the addressees of this Surah were only these people, why then does this Surah still continue to be recited when they are dead and gone from the world long long ago? And what was the need of making this Surah a part of the Qur’an permanently so that the Muslims should continue to read it for ever afterwards? 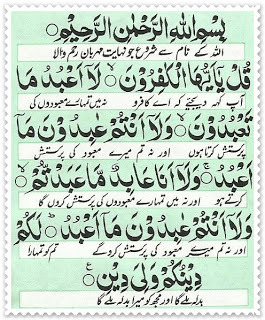 Reciting this Surah protects you and you do not feel fear if you recite this Surah before you sleep. Moreover, if you recite this Surah during Salaat, the Almighty Allah grants you forgiveness for your sins. when you lie down in bed to sleep, recite Qul ya-ayyuhal kafirun, and this was the Holy Prophet’s own practice also; when he lay down to sleep, he recited this Surah.” (Bazzar, Tabarani, Ibn Marduyah). The Prophet would recite these two in his bowings before the dawn prayer. As you can see that this Surah holds great importance for the Muslims and in the Holy Qur’an. If one recites this Surah keeping in mind the background of this Surah, it helps him purify his mind and soul from Shirk. Besides that, each of us should make this Surah a part of our routine to keep us safe from Shaitan and his traps, and from Shirk too.